OCTOBER 23--Garrison Keillor, host of the radio show 'A Prairie Home Companion,' has gotten a Minnesota judge to issue a restraining order against a Georgia woman who he alleges has been calling, e-mailing, showing up at his home, and sending him bizarre gifts over the past six months. According to an affidavit filed in Ramsey County District Court, Keillor first came into contact with Andrea Campbell, 43, in April while greeting fans after a performance of his show and noticed her 'odd and overly-exuberant' behavior. 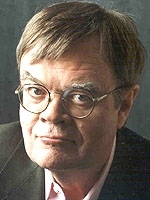 In subsequent months, Keillor began receiving perfumed packages at work containing, among other things, 'a petrified alligator's foot, dead beetles...rocks, marbles' and magnets with his and Campbell's initials on them.